Unlike many dentists in the community, Dr. Palani is skilled in both surgical implant placement and the tooth restoration using crown and bridgework. He is one of few dental implant dentists in the area to have attained Fellowship status with the International Congress of Oral Implantologists. This is a significant advantage for the patient who requires not only restoration of natural function, but also a beautiful cosmetic result. Dental implant surgery replaces missing tooth roots, and forms a stable foundation for replacement teeth that look, feel and function like your natural teeth. Dental implants also preserve the remaining bone by providing the stimulation previously provided by the natural tooth roots. The preferred method of tooth replacement has become dental implant treatment. With dental implants it is not necessary to grind down the adjacent teeth for a bridge, or secure a partial denture to adjacent teeth with clasps which can cause tooth loosening. Implant-supported replacement teeth spare patients many of the disadvantages of traditional false teeth. Dental implants are so natural-looking and feeling that you may forget you ever lost a tooth. You know that your confidence about your teeth affects how you feel about yourself, both personally and professionally. Perhaps you hide your smile because of spaces from missing teeth. Maybe your dentures don't feel secure. Perhaps you have difficulty chewing. If you are missing one or more teeth and would like to smile, speak and eat again with comfort and confidence, there is good news! Dental implants are teeth that can look and feel just like your own! Under proper conditions, such as placement by an experienced and skilled surgeon and diligent patient maintenance, implants can last a lifetime. Long-term studies continue to show improving success rates for implants. 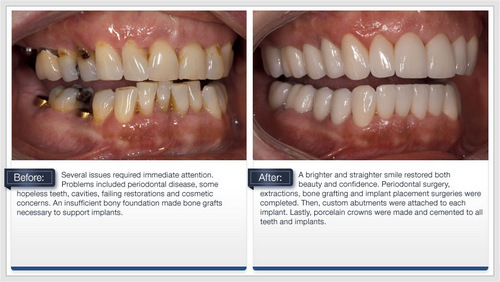 We now have ceramic dental implants! Learn more about ceramic dental implants. The base is prepared by removing the decayed tooth and repairing any bone damage, then the actual implant needs to be installed. An incision in the gum is made and a portion of bone is removed, then the implant screw is installed. More than one implant can be placed at once. 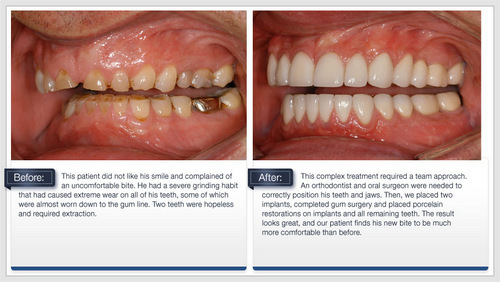 After the implant(s) are installed the gums are sutured. To learn more about the dental implant process click here.